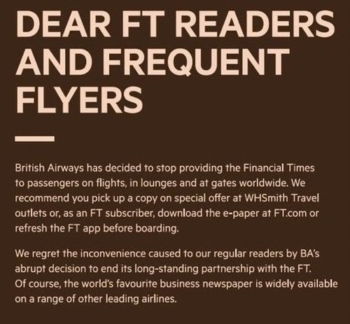 British Airways has pulled the Financial Times from its flights, lounges and boarding gates. The Sun, apparently, will continue to be available ….. This was clearly not a decision taken by the FT, since it has published the following advertisement encouraging people to fly with other airlines if they want to get their hands on a copy! It would be interesting to see what was behind this. Historically, publishers paid to have their magazines put into airport lounges – I’m not sure about newspapers. BA, to be fair, always seems to have imposed a quality threshold as well, something which many other airlines would do well to learn from. There is some good news for anyone who has to use Luton Airport on a regular basis. No 1 Lounges is opening one of its superior Clubrooms lounges in July. Clubrooms are positioned above the standard No 1 Lounges, with table service and a ban on children under 12. They are used primarily by airlines for their business class passengers – which does allow some children to get in – although it is possible to pay for entry too. The bad new is that Clubrooms are never available via Priority Pass or any other lounge club card. At Gatwick you are allowed to pay a supplement to use Clubrooms instead of using the main No 1 Lounge for free, but I don’t know if this will be possible if there isn’t a No 1 Lounge in the first place! The existing Aspire lounge, which we reviewed here and which has been fully refurbished in the last couple of years, will remain. You can find out more on the Luton page of the No 1 Lounges website. Hat-tip to Business Traveller. PS. My attempt to review the new No 1 Lounge in Edinburgh on Sunday, at the super-peak time of, erm, 2pm, was thwarted by ‘sorry we’re full’. If anyone is passing through Edinburgh and would like to do a review for us, please let me know. Assuming you have a Priority Pass, we’ll pay the £5 reservation fee to guarantee you get in! 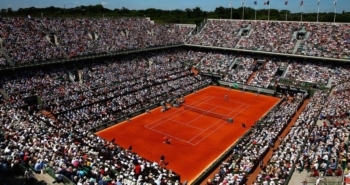 If you’ve always wanted to go to Wimbledon but never managed to get tickets, Emirates Skywards members can now access the next best thing – the French Open at Roland-Garros in Paris. Standard ground entry tickets cost from 7,000 to 15,000 miles per person depending on day. Hospitality tickets start at 20,000 miles per person and increase to 90,000 miles per person for the Men’s Final. Emirates Skywards is an Amex Membership Rewards partner and points transfer instantly if your accounts are already linked. Full details can be found on the Emirates website here. Thanks to Rob for this. A bit like that unfortunate adventure when British Airways changed their tailfins to weird irrelevant and exotic and Virgin Atlantic immediately changed their own tailfins to more ‘British’ traditional than British Airways’s own tailfins now were…!!! I’m glad this is looking bad for British Airways. It was a stupid decision. If you were in any doubt about British Airways enacting true “British” whilst owned by the Spanish corporate group IAG, and if anyone still thinks of them as a flag carrier for wellknown high quality British things, well, now you know. The biggest shareholder is Qatari! They might as well decorate a plane in Harrods colours then to make the point. The ownership of BA via IAG is 21.5% Qatar Airways, and then a series of funds. I think assuming it’s British owned in any meaningful sense is quite a stretch. What’s funny? It’s a normal for a publicly quoted company to have broad ownership. Having shares quoted on a London based market doesn’t make you British. I’ve no idea but I’m sure someone will know roughly what proportion of the FTSE 100 is owned by non-UK. IAG has its head office in Madrid and is registered in Spain. Haha love it 😀 my next long haul is with them so looking forward to it. Not sure about BA’s “quality threshold” given they used to always have the Mail and are still circulating the Sun… A little like their catering and cleaning there’s a significant gap between the marketing and the reality. I have been chasing Virgin for months as I haven’t received any miles due from from train tickets and partner airline trips (I’ve checked and all claims were eligible according to their terms and conditions). The response times have been awful. anyone know if Virgin Atlantic gift vouchers and gift cards can be used to pay for taxes and fees on a redemption booking? OT: Plaza Premium Lounge T5. Does Amex platinum only allow the main cardholder to enter the lounge? Are supplementary card holders also given access? I’m travelling to LAX (2 adults, 2 children) and trying to work out most cost effective way of using a T5 lounge. Amex Plat has lounge entries for 2 people, per card and for each supp. so 2 parents each with a card could also get 2 kids in. If you don’t have access to BA lounges then IMV there is most definitely no other lounge worth accessing in T5. Spend your money in one of the restaurants like Gordon Ramsay’s instead. *that’s “except Plaza Premium lounge”, other than the BA lounges, there’s no other lounge worth accessing – it;s either PP or BA. otherwise restaurants..
Supp can go in with their Plat, plus a guest each. Looking to squirrel away £50,000 for a few months, any points earning possibilities? 2 on here – Virgin and Nutmeg – that I can recall. However some comments said more important than points/avios etc., is the ability to safeguard and ideally improve the value of your investment. There are some other types of sites that we don’t talk about much here that might also have some possibilities. Same comment would apply to that route though too. I concur! Guyanese Dollars are much safer than Pound Sterling. a past kinship (. In this Shahrukh Khan has played role just as the one playued in Super Hero. I was in the Edinburgh lounge yesterday (maybe two days ago, it’s confusing with the jetlag). Didn’t have time to take any photos as was there with two children under 4, but it’s a decent sized lounge, was easy to find a table for 4, unlike the aspire lounge in Heathrow terminal 5 which was a nightmare. They had normal section of drinks, think first proessco might have been free. I didn’t have any because of the two kids, and it being 7 am. The food was actually quite nice, they had a decent choice of freshly cooked breakfast stuff. I had a poached egg bowl which had beans and mushrooms in. The only odd thing was that they seemed to struggle to understand my request for bread. Kept bringing out toast. I was flying in Qatar airways business, and the good thing was that they would phone the lounge and tell you when they were ready for you to board.